Today I’m excited to share with you my garlic herb bread, which is one of my absolute favorites for making sandwiches. Filled with flavorful Italian herbs and garlic, this simple loaf of bread turns an ordinary turkey sandwich into something extra special. What’s more, it makes a delicious crusty garlic bread as well. Simply cut off a thick slice, spread on some butter, and pop it in the toaster oven. Voilà, instant garlic bread… Yes, this admittedly sounds ridiculously simple, but it is oh so good. As with all of my breads, I like to prepare the dough in my bread machine and then bake off it off in the oven. This is my favorite method because the bread machine does the dirty work, and I’m not left with a weird cube of bread for ginormous sandwiches. (If you have a bread machine, you know what I’m talking about) That being said, if you prefer to make your bread dough by hand or in your stand mixer with a dough hook, go for it; each method works great and will yield delicious results. Do you like making your own bread? Do you use a bread machine or do you make it by hand? Let me know below! Water, butter, sugar, salt, garlic powder, herbs, flour. Make a small well in your flour and pour the yeast in the hole, being sure it does not touch the water. Set machine for the dough setting and press start. Once dough is prepared, lightly flour your work surface and knead your dough a few times, releasing any air bubbles. Flatten your dough into a long rectangle, and starting from one of the short ends, tightly roll your dough into a compact loaf. Place loaf seam side down in a greased 9×5 bread pan (I use a glass pyrex baking dish). Cover loaf with a clean kitchen towel and allow your bread to rise, in a warm, draft free area, until it doubles in size. **Most recipes state that this rise time takes close to an hour…HOWEVER, I find my bread rises in about 20-25 minutes. Be sure to keep an eye on yours the first few times so it doesn’t go too far. While the dough rises, preheat your oven to 350 degrees. Once dough has doubled in size, place the pan in the center of your oven and bake for 25-30 minutes; you will know it is done when the bread is golden brown, it sounds hollow when you knock on the top, and your kitchen smells AMAZING. Remove your bread from the oven and turn it out on a cooling rack. *You may need to run a knife around the edges first to release any stuck edges. However, I RARELY have to do this, as long as I remember to spray my pan well. 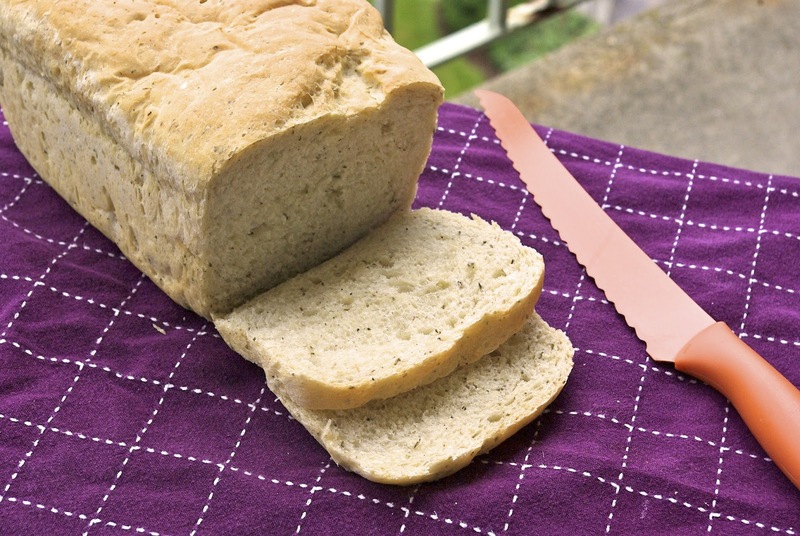 TRY to wait at least 10 minutes before cutting into your bread, (admittedly I can never find the strength…)and enjoy! This looks yummy. I love adding herbs to bread. I don't think I can make a regular loaf – or baguette – without adding something. Thanks Holly. I agree, "add-ins" to bread are awesome. I am playing around with a whole wheat version now that includes different seeds and oatmeal.